Liverpool, England's most successful club and one of the greatest teams to grace to global footballing stage, often revered for their history and past victories. However, rewind the clock to the 1950s and you find The Reds languishing in the nation's second-tier, Division Two. Despite pre, and for a short while, post-war domestic triumph Liverpool were soon an aged side in need of immediate reinvention. The inventor? William "Bill" Shankly. Prior to 1959, Liverpool had already had an eventful history since its establishment in 1892. The club had already managed to claim four league titles before the First World War, their first coming in 1901, as well as three Second Division crowns, the league they now found themselves in. Following the Second World War the club began strongly, securing the 1946-47 title thanks in part to Scottish International Billy Liddell and future manager Bob Paisley. Liddell remained at Anfield until 1961, but by 1959 was aged 37 and a symbol of the club's failure to develop on "Liddellpool's" past success and nurture a new breed of talent. Liverpool had been relegated to the Second Division following the 1953-54 season, finishing bottom and ending their 50-year tenure in the English top flight. Don Welsh's side was in need of a change from the rigid, outdated tactics shown up not just at club level but internationally with the 6-3 humbling of England by the Mighty Magyars. Welsh's successor was Phil Taylor, a former player who despite boasting a decent record and win ratio could not quite gain Liverpool the promotion back to where they belonged. After three near-misses on promotion under Taylor and a poor start to the 1959-60 season it was time for Liverpool to part with the former fan favourite and reinvent the club. The first action was hire a new manager, who on 14th December 1959 was confirmed as Huddersfield Town boss Bill Shankly. Shankly himself was a former professional player as well as manager, becoming a cult figure at Preston North End after 16 years at the club (albeit 6 of them whilst enlisted in the RAF). Following Huddersfield's 1-0 win over Liverpool in November, Shankly was offered the job being asked by Liverpool Chairman Tom Williams to "manage the best club in the country", to which he replied, "Why? is Matt Busby packing up?". Of course despite Matt Busby being the manager of Liverpool's rivals Manchester United it proved Shankly was not afraid to be controversial as well as a master of the one-liner. Shankly accepted the job and the regeneration of the club was about to begin. 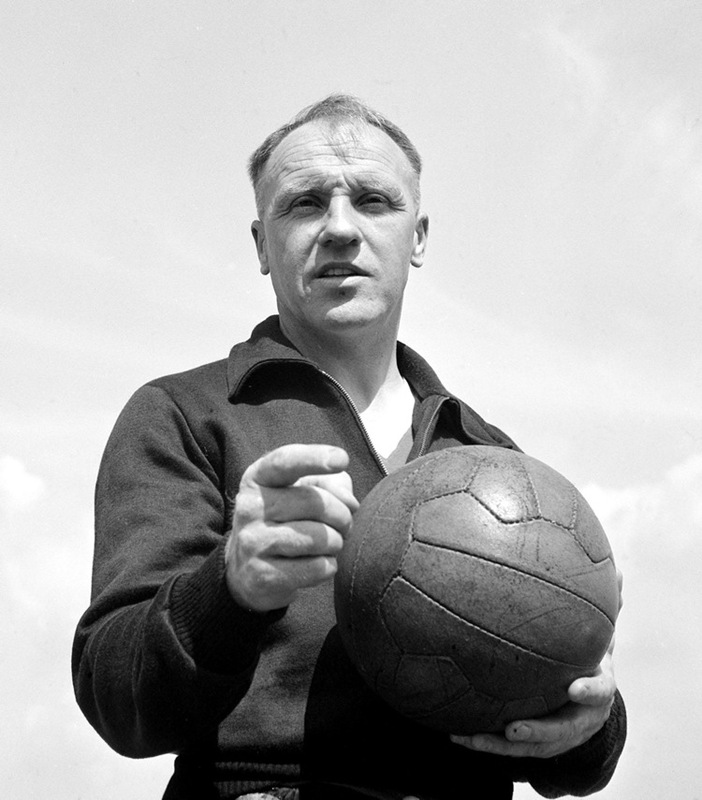 Despite a poor start to life at Anfield, including a 4-0 opening defeat at the hands of Cardiff City before losing to Charlton 3-0, Shankly steered the ship to a final third place finish before 4th the following year. It was another two near-misses for the Merseyside club but a total transition had taken place both on the field as well as off it. Shankly had gradually began to phase out the older players like Liddell and began the promotion of young talent - many from the club's reserves. Roger Hunt, Gordon Milne, Gerry Byrne and Ian Callaghan were just four of the younger players to rise through the ranks. Liverpool finally gained promotion at the end of the 1961-62 season after finishing top of the league, Roger Hunt scoring 41 league goals in the process. Shankly had brought in defender Ron Yeats that season and was quickly name captain, the manager himself proclaiming "I've bought a colossus", with regards to Yeats' masculine physique. The jigsaw was completed with Yeats' signature, alongside striker Ian St. John as Liverpool were promoted and the 8 years of disappointment ended. As previously mentioned, Shankly developed Liverpool far more than just what was displayed on the pitch. For Shankly their was no other option than to win, even as a newly-promoted club, the ambition was clear, to win the First Division title. For this he kept the same backroom staff which Taylor had worked with previous. The so-called "Bootroom Boys" of ex-player Bob Paisley, Scot Reuben Bennett and Joe Fagan described by the Liverpool Illustrated History as "a legendary committee" would become the linchpin the the Anfield club's success. Through training, Shankly completely altered not just Liverpool but the whole system of the English game. At Melwood, a training complex described as a "shambles" when he first arrived, Bill transformed the club and the facilities used. Exercises were aimed to train you like "footballers, not marathon runners or circus acts", as Shankly developed a side more used to the fast-paced nature of the 1960s game. The introduction of five-a-side games played at a fast and frantic rate suited The Reds to the modern game and improved radically the player's fitness. The inclusion of the "Sweat Box", a similar technique to that used presently at Borussia Dortmund also brought some players close to collapse, Roger Hunt proclaiming, "Training at Liverpool is the hardest job in football". The training which Shankly considered"vital", paid off as soon as Liverpool's second season in the top flight. The 1963-64 season pitted The Reds against a Manchester United side rebuilt following the tragedy of the Munich Air Disaster in 1958. Following a 3-0 victory over Busby's side at Anfield, Shankly's Liverpool need just two more points to seal the title with three games to spare and at the height of the international "Beatlemania" the Kop sang their side to a crushing 5-0 victory and the first title for 17 years. The fans, seen by Shankly as the real beating heart of the club famously sang "She Loves You" in a pitch-side spectacle rarely seen today. Following the success of 1964 the Kop would go on to make celebrating a regular custom, as Liverpool won their first ever FA Cup in 1965, beating Leeds 2-1 in the final. The 1965 season brought Liverpool an all-red kit and for Shankly his first taste of continental competition, reaching the European Cup semi-finals only to be controversially defeated by Inter Milan 4-3 on aggeragate. A poor refereeing display leaving Shankly understandably gutted of which ever since suspicions of match-fixing have arose, Shankly stating "Inter beat us 3-0 but not even their players enjoyed the game and we didn't think two of their goals were legal." Despite the disappointment Liverpool would go on to greater things under Shankly, winning the 1965-66 league and providing World Cup winners England with three members of the all-conquering squad (Callaghan, Hunt and Byrne). 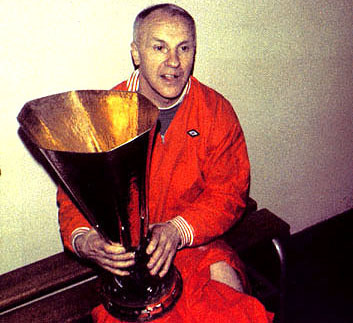 Later success was to be found for Shankly in the 1970s as he assembled one of Liverpool's greatest squads. The signature of Emlyn "Crazy Horse" Hughes in 1966 proved the cornerstone of the 70s side, with further acquisitions of Heighway, Hall and Toshack further increasing the options for the side Shankly believed was of only two on Merseyside - "Liverpool and Liverpool Reserves". The attack on Everton coming to fruition in the 1971 Cup semi-final as Liverpool defeating their city rivals 2-1 before being on the reverse of the scoreline in the final against a Charlie George inspired Arsenal. Despite defeat Shankly's later years were laden with victory, providing the "foundations" as one Liverpool banner suggests for Paisley's later achievements. The league title was regained in 1973 to alongside the club's first taste of European silverware, the UEFA Cup. The almost telepathic understanding between forwards Toshack and Kevin Keegan fired Liverpool to a 3-2 aggeragate scoreline over Borussia Moenchengladbach. The 1973-74 season provided Shanks with his last major trophy, the FA Cup after a 3-0 scoreline over Newcastle United at Wembley or "Anfield South", a match which has now gone down as one of Liverpool's greatest ever triumphs. On the 12th July, 1974 however, Shankly shook the footballing world by retiring from the office of Liverpool Manager following 15 trophy-laden years in charge. To this day it remains one of the most shocking moments in English footballing history. Shankly had felt tired from the the years of service given to the club and the devotion to his wife Nessie of whom had asked him to retire had confirmed his belief that the time was right to retire. Despite Shankly's initial reluctance to accept the resignation he had himself unwittingly provided, due to him often turning up to Melwood, an act some deemed undermining of new manager Bob Paisley, the club would continue in his legacy. Under Paisley, Liverpool would win 6 leagues, 3 European Cups, 4 League Cups and a UEFA Cup, a haul no doubt with a lot to thank Shanks for. Shankly, between 1959-74 had completely transformed Liverpool from a second-tier club to one of Europe's greatest and supplied the foundations for future success. He is often referred to as one of the world's greatest ever managers, tacticians, trainers and innovators and long may it continue! "Some people say football is a matter of life and death but I can assure you it's much more important than that"